10. What Is Minimally Required to Elicit Placebo Effects? 11. Critical Life Functions: Can Placebo Replace Oxygen? 18. Can Knowledge of Placebo and Nocebo Mechanisms Help Improve Randomized Clinical Trials ? 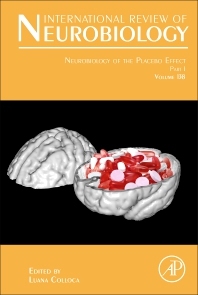 Neurobiology of the Placebo Effect, Part I, Volume 138 in the International Review of Neurobiology series, is the first of two volumes that provide the latest placebo studies in clinically relevant models. Placebo responses effects are not merely a psychological, but a complex psycho-neuro-biological process that requires activation of distinct brain areas. This book discusses current research and projects on the involved brain circuitry and neurotransmitter systems. Specific chapters cover such topics as pharmacological conditioning of the endocrine and immune system, expectancy modulation of opioid neurotransmission, nocebo effects in visceral pain, and conditioning as a higher-order cognitive phenomenon, amongst other topics.